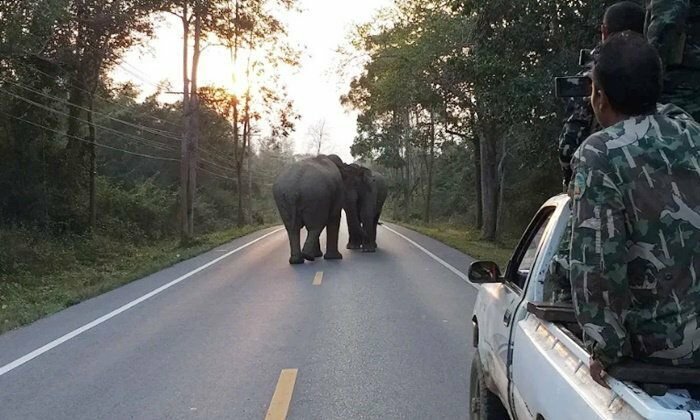 The head of Thailand's Kaeng Krachan national park in Petchaburi said that rangers were called to a tourist area after two elephants were holding up the traffic. The elephants - one known to rangers as "Jao Bunmee" - were squaring off at kilometer 21 on the Phusai to Sai-en road leading to the popular tourist attraction of Pala-u waterfall. Park chief Mana Phermphoon said that still photography and a video clip of the incident was rarely seen evidence of an annual territorial dispute among wild elephants.